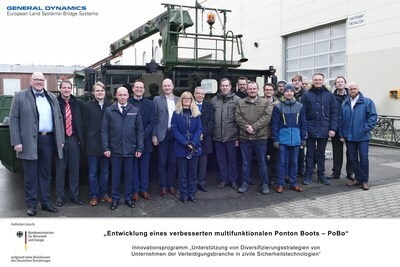 MADRID, Jan. 28, 2019 /PRNewswire/ -- General Dynamics European Land Systems-Bridge Systems (GDELS-Bridge Systems) announced today that it has been awarded a contract to develop a multifunctional, modular floating platform known as Pontoon Boat, or PoBo. The project was awarded under the Innovation Programme for the Support of Diversification Strategies of Defense Companies in Civil Security Technologies, or DIVERS. DIVERS is a program launched by Germany's Federal Ministry of Economics and Energy (BMWI), with VDI Technologiezentrum GmbH as the responsible project executing agency. "The PoBo is a modularly configurable floating device," said Sascha Wahlster, head of civil activities for GDELS-Bridge Systems. "It can be used to assemble heavy-duty transport, working, diving and recovery platforms or bridges." "By means of specially developed propulsion systems and supported by drone based underwater sensors, safe, semi-autonomous driving in flooded and unmapped areas will be made possible," said Wahlster. "Essential for the success of our application was the integration not only of existing long-standing cooperation partners such as the Entwicklungszentrum für Schiffstechnik und Transportsysteme e.V. (Development Centre for Ship Technology and Transport Systems, DST) in Duisburg and the Bremen-based company szenaris specialized in learning programs and simulations for digital learning," said Christian Kauth, Managing Director of GDELS-Bridge Systems. "Through our collaboration in the Science and Innovation Alliance Kaiserslautern (SIAK) and the Commercial Vehicle Cluster (CVC), many new cooperation approaches have emerged." "Consequently, the integration of the Institute for Robotic Systems at Kaiserslautern University of Technology and the Fraunhofer Institute for Industrial Mathematics (ITWM) into the project developed," Kauth said. "The decisive factor, however, was that we were able to win the German Federal Agency for Technical Relief (THW) in close cooperation with national fire brigades and police authorities as a project partners, as this is the only way to successfully develop a system that optimally supports relief, rescue and security forces in their challenging tasks worldwide."